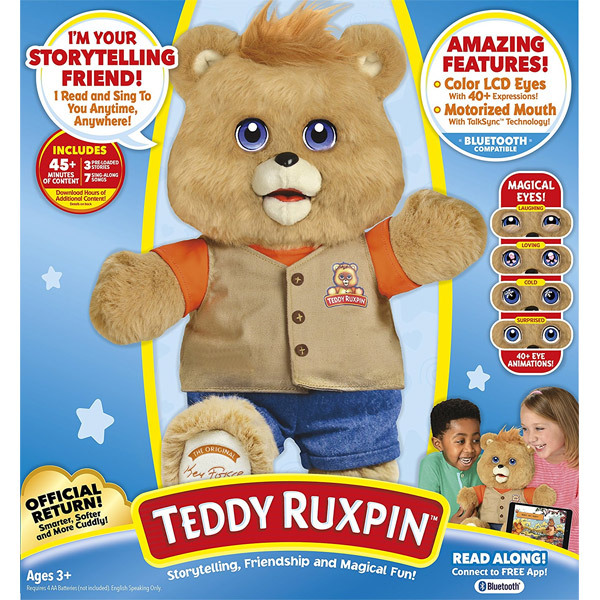 Teddy Ruxpin Is Back and Better Than Ever, But Not Destined to be a Classic! Wicked gives Teddy Ruxpin a 21st century makeover and brings some innovation to the table, but is it enough to compete with today’s toys? Not quite! Yet parents will still get all nostalgic over the return of their favorite iconic 80s storytelling teddy bear and want to share this endearing childhood experience with their own children. 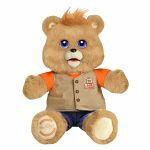 Teddy Ruxpin: He’s Officially Back! Teddy Ruxpin, the iconic loveable interactive storytelling bear from the 80s, is being magically brought back to life this year by Wicked Cool Toys in his fifth iteration. In 1985, the original Teddy Ruxpin became an overnight sensation and went on to become the best-selling toy of 1985 and 1986.Practically every kid in America wanted one under the tree. Looking back Teddy Ruxpin was way ahead of its time being the first interactive plush toy to infuse technology into its design and pave the way for talking interactive toys. Remember the cassette? 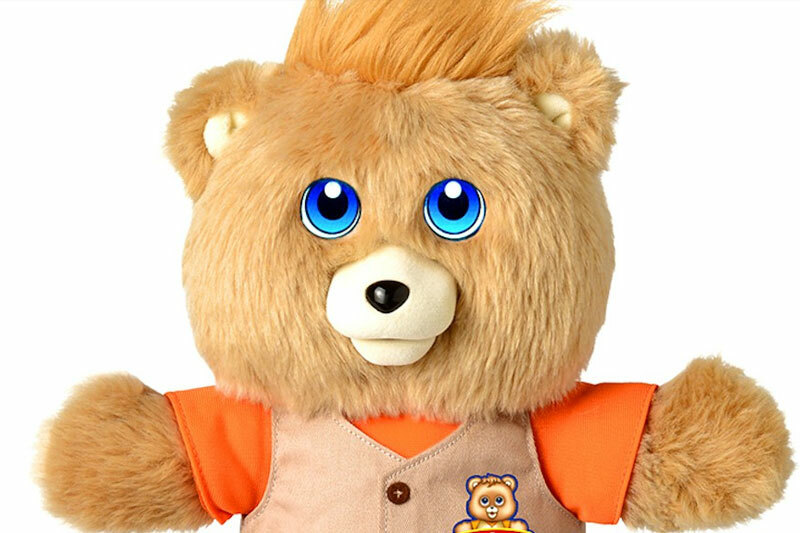 Flash forward to 2017 … now Teddy Ruxpin has been given a 21st century makeover. He’s back and he’s better than ever, however, it’s not destined to be a classic due to design shortcomings and a lack of content out of the box. Nevertheless, millennial parents who grew up with Teddy will want to share this endearing experience with their own children. What Does Teddy Ruxpin Do? 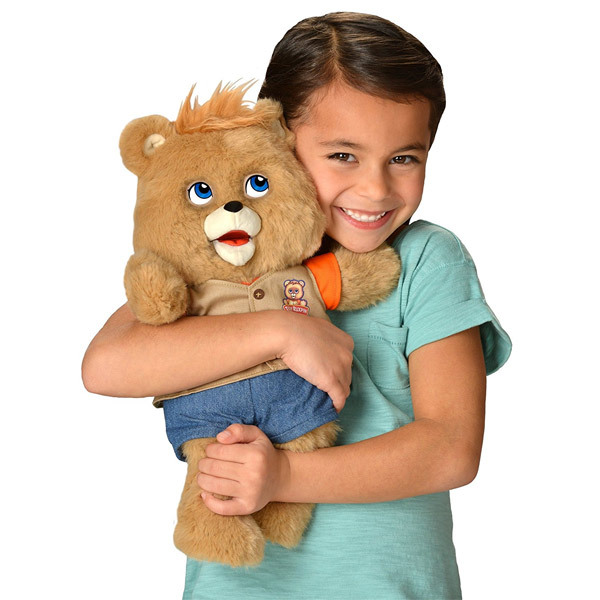 Teddy Ruxpin is a 14-inch animated interactive storytelling companion teddy bear designed for kids ages 2 and older. In addition to telling three stories, Teddy also sings seven sing-along songs to entertain children. Young kids will really love singing along with Teddy. Although the free iOS and Android companion app is not required, it enhances the overall experience by allowing kids to visually experience the story with beautiful illustrations as well as read along with the digital storybook. This is actually a welcome addition to the new 2017 Teddy Ruxpin. Teddy features sound effects, music, voice acting and emotions to vividly bring the stories and songs to life. 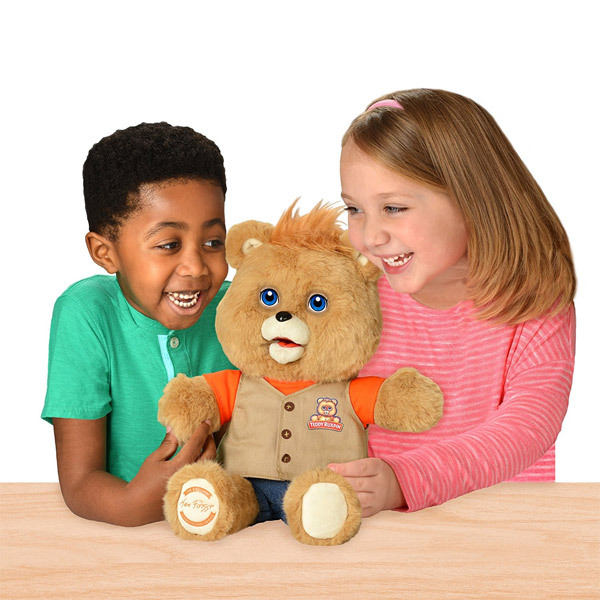 Teddy Ruxpin is designed to develop childhood literacy as well as be a fun, friendly companion. It also is a great toy for building comprehension and vocabulary, sparking your child’s imagination, and teaching kids a variety of fun facts. Let’s also not forget that he’s a loveable and cuddly teddy bear that’s ready to be your child’s friend and take him or her on an exciting and magical adventure. At its core, he genuinely instills a love of reading and adventure. It’s worth comparing the classic Teddy Ruxpin made by Worlds of Wonder with the new one for nostalgia-seekers. The 2017 edition of Teddy Ruxpin made its debut in August 2017, retailing for $100, just like the original. The original storytelling bear featured 22 adventures and music programs, whereas the new one features only 3 pre-loaded stories and 7 interactive songs. The original storytelling bear featured 22 adventures and music programs, whereas the new one features only 3 pre-loaded stories and 7 interactive songs. The three included stories include The Airship, Captured By Mudblups, and All About Bears. Each story lasts about 15 minutes or so and includes at least one song. All About Bears teaches kids about different types of bears and features five songs for kids to sing along with, making learning fun and delightful. That amounts to over 45 minutes of pre-loaded content. Additional content may be purchased individually for $4.99 each or as a bundle of seven for $24.99 via the companion app for your smart device. This bundle saves you about $10 versus buying content individually. A smart device is required for content expansion. Ten total stories will be available at launch with ten more planned sometime next year. Unlike the original, only pre-approved content can be played. The classic bear was much heavier due to the integrated cassette player. Now Teddy has gone all-digital and the cassette player is a thing of the past, making him much lighter. The new Teddy is also smarter, softer, and more cuddlier than ever before thanks to the improved technology and smaller electronics. Parents and kids will instantly notice Teddy’s glowing LCD animated baby blue eyes, which make him look super adorable and cute. Stare into his eyes and your child will instantly fall in love. However, when he’s powered off he doesn’t have any eyes and it just looks like a deep, dark void, which may look a bit creepy to the little ones. The eyes are said to be the window into our souls. It looks like Teddy is literally missing his soul when he’s asleep. Thankfully, Wicked has included a cute face mask for when he’s ready for some beauty sleep and it also serves to protect his LCD eyes. Parents and kids will instantly notice Teddy’s glowing LCD animated baby blue eyes, which make him look super adorable and cute. Stare into his eyes and your child will instantly fall in love. His new digital eyes add so much personality and expressiveness that was simply not possible before. Kids will see hearts for friendship and love, rainbows, globes, and more. In fact, he can display a whole range of emotions from laughing, loving, and surprised to cold, joyful, thoughtful, and more with more than 40 expressive animations that are synched with the story. What kid wouldn’t want to befriend a caring, loving, joyful bear? He still features an animatronics mouth that is lip-synched with the stories and songs, making it feel like Teddy is alive! The mechanical mouth motor is noticeable but not as loud as before. Now he has kid-friendly touch sensors in his hands and chest to control Teddy’s actions. His clothing and fur look fantastic and are high quality and the voice overs are well done for the most part, keeping kids engaged in the adventure. Just like the original version, the new Teddy is powered by four (4) AA batteries, which are required but not included. The great thing is that when the stories and content have been synched, there is no need for Wi-Fi to enjoy all the great content so kids can make storytime anytime and anywhere! 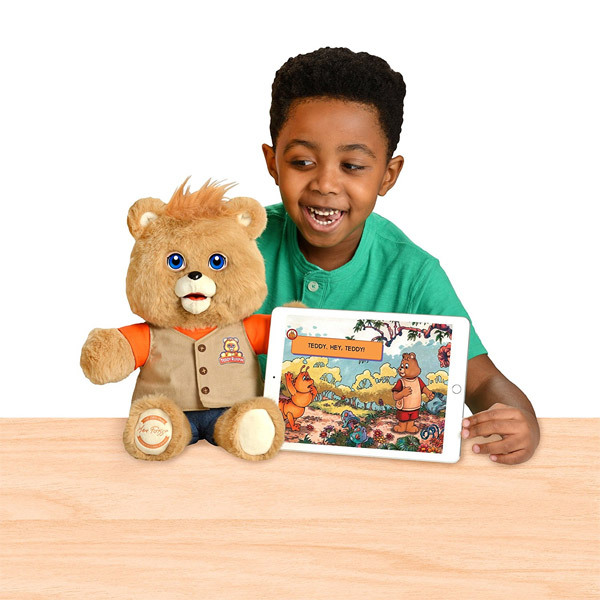 Teddy Ruxpin is packed with a ton of new exciting technology that helps usher him into the 21st century. He’s gone all-digital in this tech makeover. First, he features animated LCD eyes that lend to his personality and make him more expressive than ever. Additionally, he has an animatronics mouth with TalkSync technology that is perfectly synched with the stories and songs. Don’t worry – if your child puts his or her hand in its mouth, it can detect obstacles in its way and prevent injury. Since he is Bluetooth-enabled, Teddy can connect wirelessly to a free companion iOS or Android smart device app so your child can read along and watch how the story unfolds. During our evaluation, we were able to connect with relative ease. The app showcases a digital storybook, which helps bring a visual dimension to the storytelling. The embedded electronics are now smaller than ever, making it lighter and more cuddly. Lastly, the integration of touch sensors makes for a kid-friendly user interface that is simple and straightforward to use. Press his left paw to advance to the next story, press his right paw to pause the action, and press Teddy’s chest to sing along. A smartphone or tablet is required for app use. Teddy Ruxpin is compatible with iPhone 4S / iPad 3 or higher and Android 4.3 or higher. To update Teddy’s content, you’ll need to connect him to your PC with a USB cable that is not supplied. New and Improved … But Is it Better? With all this great technology packed into the new Teddy Ruxpin, it was almost guaranteed to be new and improved. But this question remains: Does this new Teddy Ruxpin live up to the original and is it better? Honestly, we feel the tech, especially the digital storybook component is a wonderful addition, but we honestly feel overall it could have been far greater. Honestly, we feel the tech, especially the digital storybook component is a wonderful addition, but we honestly feel overall it could have been far greater. Certainly, it’s cool tech but – as it stands – we don’t feel there’s enough content to warrant the $100 price tag out of the box plus another $25 for another seven stories and songs. The original offered much more content for $100. Nowadays, parents expect more value from their toy purchases. We think nostalgia – more than anything – may act as a driving force for many purchases. Here are a few suggestions for a potential future iteration of Teddy Ruxpin. First, we would add more stories and songs right out of the box. Ten stories would be a great starting point. Ideally, the digital stories should have animation to bring them to life in a whole new meaningful way. Since literacy is a primary focus, each word should be highlighted or emphasized as Teddy reads the words on the digital storybook. Further, we’d love to see more language options to better reflect our diverse culture today; he presently only speaks English. It would be awesome if Teddy featured more expressive facial animations, like smiling, laughing, surprised, etc., and arm and head movements to make him feel more alive. Spin Master’s Luvabella is a great example where they’ve pushed the boundaries of what is possible. When Teddy is powered off, he should have some eyes in place so it doesn’t look so creepy to kids. Adding a personal touch where Teddy could record and say your child’s name would really go a long way toward creating a tighter-knit friendship. Our dream would be to have Teddy be even cuddlier. Lastly, the design should allow for expanding content without the need for a smart device. The new Teddy Ruxpin introduces a ton of flashy new tech but at the heart that magical feel of the original seems to be surprisingly missing.Teddy Ruxpin was way ahead of its time back in the 80s – but we feel its technology is surprisingly behind in today’s competitive toy landscape when we have smart toys with voice-recognition technology and more advanced, realistic motion. The new Teddy Ruxpin introduces a ton of flashy new tech but at the heart that magical feel of the original seems to be surprisingly missing. Wicked should have not merely attempted to emulate the successful classic formula of the original; it should have sought to add meaningful new ideas to the formula to make it really stand out as a leader in the market. In all frankness, it seems Wicked Cool Toys played it safe by sticking too closely to the original formula without adding too much in terms of value-added functionality other than the digital storybooks. The kid-friendly stories and songs are truly imaginative and delightful and leave us wanting even more. Don’t get us wrong – we love Teddy Ruxpin and just want to see Wicked do him the justice he rightfully deserves. After all, this is an icon we are talking about and it has a great legacy to live up to. It should have had more content included right out of the box, made a few design tweaks, and pushed the envelope with regard to innovation. This is a great comeback – but it could have been so much more impactful. This could have been the toy that every young child wants under the Christmas tree. It definitely brings innovation in terms of all the technology but it falls short of delivering the ultimate Teddy Ruxpin of 2017 that we had envisioned. 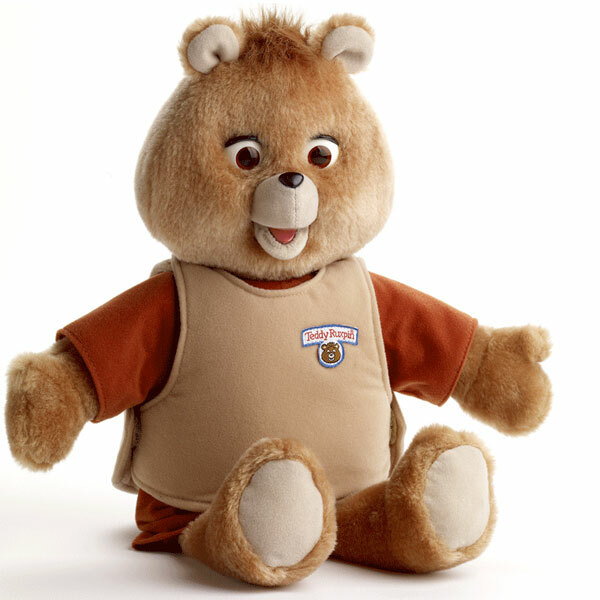 For now, twenty-five years from now people will still seek the original Teddy Ruxpin – an all-time classic. Nevertheless, Teddy Ruxpin will be on many children’s top toys for Christmas 2017 wishlists.